Thur., Feb. 3, 7-9 PM – Madison Park & Open Space Plan Meeting - Alicia Ashman Public Library, 733 N. High Point Rd. 2 - Want to Name Fitchburg Ponds? 4 - Home Gardening Statistics: Is It Worth It to Garden in Madison? 8 - Win an energy expert contest! 9 - Quick quiz: What temperature should I set my thermostat at in the wintertime? 10 - Dane County 175th Anniversary: Join the Party! 12 - Are You Cut Out for A Career in Health Care or the Life Sciences? The Madison Parks Division is updating the Park and Open Space Plan for 2011-2016. Staff is collecting public input for this plan through an on-line survey and a series of public input meetings. The purpose of the Park and Open Space Plan (POSP) is to serve as a long range planning guide for decisions made by City Boards and Commissions, City agencies and staff. It is a tool used to guide decisions for a variety of Park and Open Space issues such as city policies, park acquisitions, facility development, as well as park funding. The POSP is also a necessary component to be eligible for Federal and State grants. All Madison residents are encouraged to participate in this process by filling out the on-line survey <http://www.surveymonkey.com/s/parkandopenspace <http://www.surveymonkey.com/s/parkandopenspace> > or attending one of the public input presentation meetings. The survey is easy and also allows for input concerning current and future park programming opportunities. Madison Parks is where we play. Our community stays strong when we play together. Staff wants to take steps to ensure that your Madison Parks programming needs are met. We encourage you to take a few minutes to fill out this on-line survey <http://www.surveymonkey.com/s/parkandopenspace <http://www.surveymonkey.com/s/parkandopenspace> > by February 15 or join us at one of the public meeting presentations on February 3 or February 10. The same survey will be provided at the meeting. · February 3, 7-9 p.m. , Alicia Ashman Public Library, 733 N. High Point Rd. I am looking for neighborhood association contacts interested in serving on a Steering Committee to provide input on identification and informational signs we are planning to install adjacent to stormwater ponds and greenways in the City of Fitchburg. This signage is being funded in part by a stormwater grant from DNR with cost-sharing from Fitchburg's Stormwater Utility. 1. Input on Stormwater Facility Names. Some are named after the adjacent road, some after the neighborhood, and one facility has an arbitrary "Area D" name currently. My hope is to circulate the names we currently have and get buy-in from neighbors on what the actual name is to be referenced. 2. Input on types and preferred locations of signs. Match existing park signs? Match Dane County or DNR signage in the area? Or come up with something entirely new and different? Please feel free to contact me if you are interested in attending any or all of these meetings and I'll make sure to add you to the final list of members. If you're not able to participate, but know of others in your neighborhood who might be interested, I'd greatly appreciate you passing this message on to them. Please feel free to contact me if you have any questions, comments, and/or suggestions. Madison Metropolitan Sewerage District (MMSD), the City of Fitchburg and its residents, and UW Madison Water Resources Management (WRM) graduate students are working together on a project to evaluate the potential for using recycled treated water from the Nine Springs Wastewater Treatment Plant to recharge groundwater in the City of Fitchburg. The project is following up on concerns throughout Dane County that the groundwater table has dropped significantly over the past few decades following increased population growth and demand for water. Water recycling and subsequent recharge is one potential practice that could be used to address groundwater quantity issues. Please feel free to contact me at rick.eilertson@city.fitchburg.wi.us or 270-4264 (235-0412 – cell) if you have any questions, comments, or suggestions. An RSVP is recommended to ensure adequate refreshments (Groundwater, etc. ), but not required. Please forward this message to anyone you think may be interested. $800 worth of produce from a 20x20 foot (400 square foot) garden plot in a community garden? Is this what one can reasonably expect to harvest from a plot in the Marlborough Park in one summer? Having heard that one gardener in Madison harvested that much from his plot in one season, I was incredulous yet curious about the value of the produce I could get from my plots. Lucky for me, Vincent Smith, who is associated with the Nelson Institute for Environmental Studies at the UW, conducted a large research study this past summer, and the results are in for my garden. Before giving the statistics, I’ll let you know that I gardened in 3 places this year for a total of around 1500 square feet (about 39x39 feet). I did not get $2 of produce per square foot of garden like that sample gardener did, but then neither did the average gardener in the study. I felt pretty good about this until I read some more "ballpark" figures based on the 38 gardens/farms reporting. The average gross value per square foot was somewhere around $1.50 or about 40 cents more per square foot than I reported with net just a few cents below that. The researcher also noted that some home gardens in this study grew over $4,000 worth of food this year! However, he did not mention the size of these very productive gardens. What’s my excuse for a lower than average amount of produce? Well…. all my gardens had “issues.” I won’t mention them except to say that some were too shady and there were reasons I didn’t harvest even all that I grew. However, even without a giant monitory result, gardening for me will always have a positive spiritual bottom line. I revel in the sun and fresh air, luxuriate in the peace and freedom of working the soil, swell with pride right along with my growing vegetables, and rest assured that my super-fresh produce is chemical-free. It won’t be long until sign-up time for plots in the Marlborough Park garden. Keep tuned. Several neighbors who garden in Marlborough Park met in the park recently to start thinking about the coming planting season. Check out the pictures on the attachment. Join the Gardens Program of Community Action Coalition for South Central Wisconsin, Inc. for the 2011 Grow Together Conference. All those involved in or interested in learning more about community, food pantry, and youth gardening are invited to attend! Workshops will be offered in three conference tracks: leadership development, food pantry gardening, and youth gardening. Learn how to develop your personal leadership plan, how to start and run a successful food pantry or youth garden, gardening tips and tricks from experienced gardeners, and more. Spanish and Hmong translation and childcare will be available. Some of the conference workshops are “Constructive Conflict,” “The Many Faces of Leadership,” “Successful Youth Garden Models,” Linking Youth Gardening and Social Issues,” and Volunteer Recruitment and Management.” Several others are offered too. Amounts range from $100 to $400. Applications must be submitted within 90 days of installation. MGE partners with Focus on Energy to bring energy-saving resources and incentives to our customers. Many existing homes in Wisconsin have problems related to moisture, condensation, drafty rooms, ice dams, mold and high utility bills—which indicate the home may not have proper insulation and/or is not at the level of safety, health and comfort it could be. Partnering with the Home Performance with ENERGY STAR Program, consultants help to identify the cause of those problems and provide recommendations for getting them fixed. By completing a home evaluation you not only receive a more comfortable and energy-efficient home, but you can receive Cash-Back Rewards <http://www.focusonenergy.com/incentives/residential/cash-back_rewards/home-performance/default.aspx> for completing all or part of the work! The contest ends on Monday, Feb. 14, 2011. All entries must be received or postmarked by Feb. 14, 2011. The prize will be awarded on March 1, 2011. The winner's name will be posted on mge.com. In the essay, please answer the following question in 300 words or less: Why do you want a home energy audit? The essay will count for 40% of the contest score. The essay should explain why you want the audit, the types of challenges you have encountered with implementing energy efficiency measures, and when you would like to achieve these goals. How you express what you want to achieve will also be part of the scoring. Only one entry from each address will be accepted. Any entrant who attempts to participate with multiple submissions will be disqualified. MGE recommends you set your thermostat at 68° when you're at home and 55°* when you're sleeping or not at home. A programmable thermostat will do the work for you but you can also set back manually. It's a myth that it costs as much or more to heat a home back up after a setback. (Or to cool the house after a summer setup.) In reality, the longer your house remains at the lower temperature, the more heat you save. In 2011, we’re having a party in Dane County and everybody’s welcome! This year marks 175 years since the first Wisconsin territorial legislature created Dane County. Thanks to the hard work of a group of citizens who have spent the past six months helping plan this year-long party, we’ve selected several days for you to take pictures of the people and places that make Dane County special to each and every one of us. The first of those four “Days in Dane” comes up February 25th and I hope you’ll share your pictures through the website we’ve set up. “Dane County Passport” will showcase 12 of the most popular outdoor destinations in our county, where in addition to some peace and quiet, families will also find some fun trivia through the year. There will also be a 175th corn maze and so much more to help mark our county’s 175th birthday! *Dane County has been a county longer than Wisconsin has been a state. Dane County was created in 1836. Wisconsin became a state in 1848. *Dane County’s population back in 1836 was a mere 311 settlers. Today we’re closer to a half-million people of all ages, races, religions, and backgrounds. *The county is named for Nathan Dane, the Massachusetts man who chaired the committee that drew up the governing rules for the Northwest Territory. *The county’s first governmental unit - - a three person board of commissioners - - was elected in 1839. We have a big party planned because we have a lot to celebrate! Take some time in 2011 and join the fun, celebrating the countless things that make Dane County great! In partnership with the Wisconsin Historical Society, we’re proud to welcome UW-Madison Professor Sandra Adell and community member Betty Banks as they discuss the history of early African American Settlement in Dane County. Doors open at 6:30 pm for the 7 pm program at the Wisconsin Historical Museum on the Capitol Square. The panel will be followed by an audience talkback. Childcare will be provided and the galleries will be open. Suggested donation: $5. Four times during 2011, people who live in Dane County will be invited to submit photographs that depict life in Dane County during a 24 hour time period. These images will provide a visual interpretation of the work, play, landscapes and cityscapes that make Dane County a special place to live. We’re creating a Dane County 175th Celebration Flickr website which will allow community members to upload images up to a week after each respective Day in Dane. Photos will be available for viewing by the general public and will become part of a Community Photo Album. More information on this process will be posted prior to the first Day in Dane. Late in the year, all images will be reviewed with the hope of selecting one or more for inclusion in the 2012 art poster presented by Dane County Cultural Affairs Commission. “Journey Through Grief” is a seven-week grief support group for LBGTI adults who are grieving the death of a loved one. In addition to providing grief support, the group leader will present and discuss concepts specific to the grieving process. We recommend waiting two to three months after the death before joining a group. The group will be on Thursday evenings from 6-8 pm starting January 20th. If you register and attend by the second meeting, January 27, you can still join this group. On January 27, the group meets at HospiceCare headquarters, 5395 E. Cheryl Parkway in Fitchburg. All other sessions are held at OutReach, 600 Williamson St., Madison. Attendance at all sessions is strongly encouraged. Registration is required. Please call Cheri Milton at HospiceCare Inc. to register at (608) 327-7300. There is no fee to attend this group, but donations are welcome to offset program costs. Are you interested in exploring whether you are a good candidate for a health care career or one in the life sciences? Then you’ll want to attend "Discovering Careers in Health Care and the Life Sciences," held at the new Town Center Forum, Wisconsin Institutes for Discovery, 330 N. Orchard St., 1st floor, Monday evenings, 6:30 - 8:30 PM. For individuals interested in careers in healthcare and the life sciences, Wisconsin Institutes of Discovery presents a lecture series on what it is like to work in these fields, and the information you need to get there. At each session, Madison-area healthcare practitioners and researchers will discuss the challenges and rewards of practicing in their fields. Representatives from regional and national professional schools will discuss how to be an attractive candidate for admission to their programs. If you have questions, please contact Susan Nelson, Ph.D., Pre-Health Advisor, (608) 263-6614. Domestic Abuse Intervention Services (DAIS) works to empower those affected by domestic violence and advocate for social change through support, education and outreach. Our vision is a non-violent community that actively promotes safety, peace, justice and hope. We have been in Dane County for over 26 years working to make our community a safer, more just, more equitable place for people who have experienced domestic violence, their children, and the people who love them. We offer many support services, and volunteers are essential in providing these services to our clients and are involved in every aspect of the work we do. Our volunteer program increases support services to victims by two-thirds of what staff alone can do. All Wisconsin voters will be determining who will have a chance to serve on the Supreme Court. The incumbent (person who holds the office now) is running again. That’s David T. Prosser Jr. of Appleton. Three others are vying for a chance at the office: Joanne F. Kloppenburg, Madison; Joel Winnig, Madison; and Marla Stephens, Milwaukee. Madison voters in our neighborhood – the Crawford, Marlborough, and Allied portions of the Dunn’s Marsh Neighborhood – will choose from among 3 candidates for 10th District Alder. Our current alder is Brian Solomon who lives on West Lawn Avenue. He’s running for another term of office and will be facing 2 other hopefuls: Nelson Donovan who lives on Keyes Avenue and Thomas Farley who lives on Eton Ridge. The Fitchburg part of the neighborhood votes for alder candidates running for Fitchburg District 1, Seats 1 and 2, but there are no primaries for these seates. Carol Poole, former long-term treasurer for the Dunn’s Marsh Neighborhood Association, is running unopposed for Seat 1. She won this seat during the last election. Carol lives on Crescent Road. Dorothy Krause, our new DMNA treasurer – obviously also a Dunn’s Marsh Neighborhood resident - is running for Seat 2. She lives on Apache Drive. Since only one other candidate registered for Seat 2, the choice will wait until the April 5 election. The second candidate is Kevin Peterson who lives on Danville Drive, which is west of Verona Road off Williamsburg Way and not too far from Prairie Road. Now is the time to mark your calendar for the February 15 primary election. Both the City of Madison and City of Fitchburg are accepting applications for poll workers. Poll workers are those election officials you see at your voting location. They check in voters, hand over ballots, register new voters, and keep records of everything. And they get paid! But satisfaction is measured in more than dollars. Poll workers meet a lot of new people, develop working relationships with other election inspectors, and can feel the satisfaction of having done a civic duty and helping democracy work. To sign up with Madison, go to https://www.cityofmadison.com/election/election/ <file://localhost/election/election> and follow the links from Pollworker information. You’ll have to know your voting ward. For the Madison part of our neighborhood, that’s Ward 68. To sign up to be a poll worker – officially an “Election Inspector” - in Fitchburg, fill out the attached application “F pollworker ap.pdf.” Then send it to the Fitchburg Clerk's Office, 5520 Lacy Road, Fitchburg, WI 53711. A big package arrived at my door unsolicited the other day. When I opened it, I found a 3-ring binder with the title, “The Origins of Some Madison, Wisconsin, Street Names” by Burr Angle, Dolores Kester, and Ann Waidelich. Turns out that this book has a whole section on street names right in our neighborhood. I corresponded with the authors and they’ve given permission to quote from their work. This month’s story will feature street names in the Crawford area since that’s where the authors provided new information that was not part of the neighborhood history book In Our Own Words: the Best of the Dunn’s Marsh News. The Crawford area is behind the Highlander Motel and extends east to Whenona Drive. 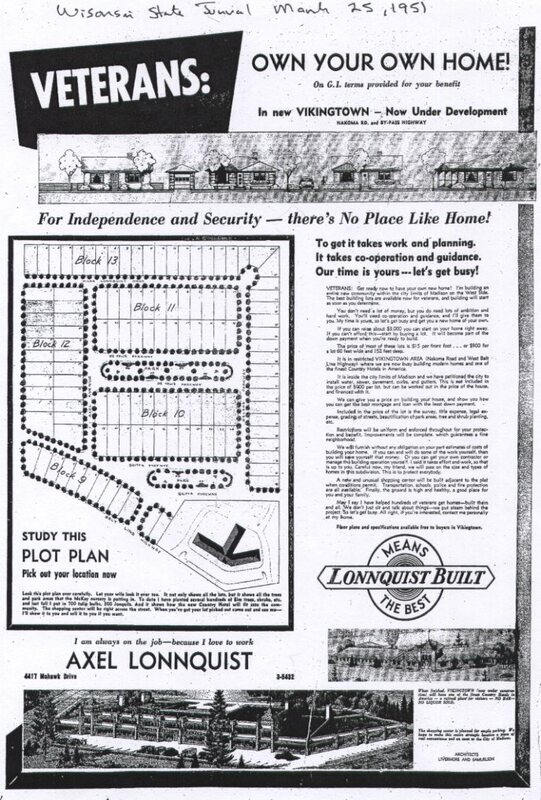 The Crawford subdivision was built by a Swedish immigrant, Axel Lonnquist. Here’s what the authors say about him and the Crawford subdivision in our neighborhood. Lonnquist was born in Stockholm, Sweden, emigrated to America in 1901, worked at various places in Canada and the U.S., and was living in the Detroit area by 1920, where he had apparently begun to build houses. By the mid 1920s he was considered a national expert on suburban developments. He was especially active in Detroit, Chicago, and the Chicago suburbs of Mount Prospect and Franklin Park. By not later than 1942 he owned a house in Madison. In 1950 at age 69 or 70 he decided to build a country hotel and subdivision both named Vikingtown south of the Beltline in Crawford Heights. The streets were named for Lonnquist himself and for family members and associates (though not for his wife Emily, son William, or daughter Audrey). They are Axel Avenue, Hilda Lonnquist Drive, DeVolis Parkway, Britta Parkway, and Helene Parkway. Britta Parkway is for Miss Britta Lonnquist (1908-1089) who lived with the Lonnquists for many years. Residents soon complained that the name Hilda Lonnquist Drive was confusing: it was changed to Crawford Drive in 1956. The Vikingtown country hotel became the Highlander motel in 1974. Elsewhere in Crawford, Niemann Place honors Otto A.W. Niemann who was the main developer of Crawford Heights. Author Burr Angle supplemented this information with a letter that detailed additional facts. Wondering how a Swede would pronounce these names, he had consulted a professor of Swedish at the UW. He learned that Axel Lonnquist would be pronounced Ox-all Lawn-quist. The professor also mentioned that Lonn means maple and quist means branch, so Lonnquist means the branch of a maple tree. Britta is is pronounced Bree-tah, and Hilda is Heel-dah. 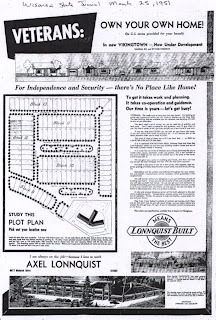 The advertisement in the newspaper tells a lot about what Axel Lonnquist held dear. Since it’s unlikely the attachment’s fine print will be readable, here’s some of what it says. VETERANS: Get ready now to have your own new home! I’m building an entire new community within the city limits of Madison on the West Side. The best building lots are available now for veterans, and building will start as soon as you determine. You don’t need a lot of money, but you do need lots of ambition and hard work. You’ll need co-operation and guidance, and I’ll give them to you. My time is yours, so let’s get busy and get you a new home of your own. If you can raise about $3,000 you can start on your home right away. If you can’t afford this – start by buying a lot. … The price of these lots is $15 per front foot…or $900 for a lot 60 feet wide and 152 feet deep. …we have petitioned the city to install water, sewer, pavement, curbs, and gutters. This is not included in the price of $900 per lot, but can be worked out in the price of the house, and financed with it…. Included in the price of the lot is the survey, title expense, legal expense, grading of streets, beautification of park areas, tree and shrub planting, etc. Every once in a while – actually quite often – I come across interesting, thought-provoking, or amusing tidbits of information. Sometimes it’s from one of the blizzard of e-mails coming to my inbox every day. Sometimes these little nuggets are in a newspaper or magazine. Others come to me word of mouth. The first one here comes from a link on the list-serve “Bikies” that I now belong to. Thanks, DMNA Council member Bob Hague, for making me aware of this awesome resource. I’ve learned a lot from it. Would you believe that building bike lanes and pedestrian projects and bike boulevards creates more jobs per million dollars spent than road repairs and road resurfacing? That’s what was found by a study of engineering, construction, and materials costs for different types of projects in the city of Baltimore. 17b - Neighbor’s Brother Gets Elected to US Senate! Did you know that new Illinois Senator Mark Kirk, the one who was elected to President Obama’s old seat, is the brother of our very own DMNA Council member Gigi Miller Solari’s brother? That’s a tidbit to pass on! These are news articles from the Wisconsin State Journal from 100 years ago as quoted in the Historic Madison, Inc. newsletter. Madison’s population reaches 25,531, up 6,367 or 33% over 1900. Madison census workers report women refused to give their ages and tried to peek at census sheet to see what information their neighbors had provided. In October the Sisters of St. Mary’s announced they’d build a Catholic hospital in the spring in the Greenbush (today’s St. Mary’s). In April, the UW began negotiating with Breese Stevens’ estate to acquire Picnic Point. If negotiations failed, many feared Picnic Point would be turned into a summer residence neighborhood. In March, the paper reported that Madison auto dealers were unable to keep up with demand. These were some of the cars buyers could choose from: Studebaker-Flanders “20” ($750), Studebaker-Garford “40” ($4,000), Overland 40 horsepower ($1,500), Marion “Flyer” ($1,850), Marmon “32” ($2,650), Buick Model 17 ($1,750), Ford Model T ($900-$1,050), Maxwell ($600-$1,575). The noted and prolific Irish writer Maeve Binchy has these tips. Capture ideas as they pass through your mind. Write them down so you don’t forget them. Because stories are basically about change, it’s important to catch that moment of change in your writing. On the writer as a journalist Deadlines are good, even if self-imposed. Use your powers of description to see something a bit different than the norm. Pay attention to what people want. This applies to memoirs as well. If writing for men, consider that men like information, how-to’s, instructions. They like excitement such as drama in high office, espionage, munitions, etc. Men like heroes and heroines to be good-looking. They like shorter books. And there are exceptions to these rules. It rained birds in Arkansas early in January, about 5000 of them. That was a drop in the bucket compared to the approximately 5 billion that die annually in this country. Those Arkansas birds most likely died by flying into things, but there are other major causes of bird demise. · Loss of habitat is by far the largest cause: we destroy the places they have lived in with development. · 334 million to 1 billion, 210 million die flying into buildings, being hit by cars, and colliding with electric lines. · Hundreds of millions killed by cats each year. · Up to 72 million are killed directly by pesticides. None of this takes into account that many bird babies dies of starvation when they lose their parents. All of this explains why about ¼ of the 836 species of birds protected by the Migratory Bird Treaty Act are seriously declining in number. If you have any neighborhood news you’d like to see in this newsletter, please call or e-mail editor Mary Mullen. Contact information is on the masthead.